Tampa (US): NASA counted down Friday to the launch of a USD 1.5 billion spacecraft that aims to plunge into the Sun’s sizzling atmosphere and become humanity’s first mission to explore a star. The 65-minute launch window opens at 3:33 am (local time), and the weather forecast is 70 per cent favourable for takeoff, NASA said. Not only is the corona about 300 times hotter than the Sun’s surface, it also hurls powerful plasma and energetic particles that can unleash geomagnetic space storms and disrupt Earth’s power grid. “The Parker Solar Probe will help us do a much better job of predicting when a disturbance in the solar wind could hit Earth,” said Justin Kasper, one of the project scientists and a professor at the University of Michigan. The shield should enable the spacecraft to survive its close shave with the centre of our solar system, coming within 3.83 million miles (6.16 million kilometers) of the Sun’s surface. The heat shield is built to withstand radiation equivalent up to about 500 times the Sun’s radiation here on Earth. Even in a region where temperatures can reach more than a million degrees Fahrenheit, the sunlight is expected to heat the shield to just around 2,500 degrees Fahrenheit (1,371 degrees Celsius). The goal for the Parker Solar Probe is to make 24 passes through the corona during its seven-year mission. The tools on board will measure the expanding corona and continually flowing atmosphere known as the solar wind, which solar physicist Eugene Parker first described back in 1958. Parker, now 91, recalled that at first, some people did not believe in his theory. But then, the launch of NASA’s Mariner 2 spacecraft in 1962 – becoming the first robotic spacecraft to make a successful planetary encounter – proved them wrong. Tools on board will measure high energy particles associated with flares and coronal mass ejections, as well as the changing magnetic field around the Sun. “We will also be listening for plasma waves that we know flow around when particles move,” Fox added. 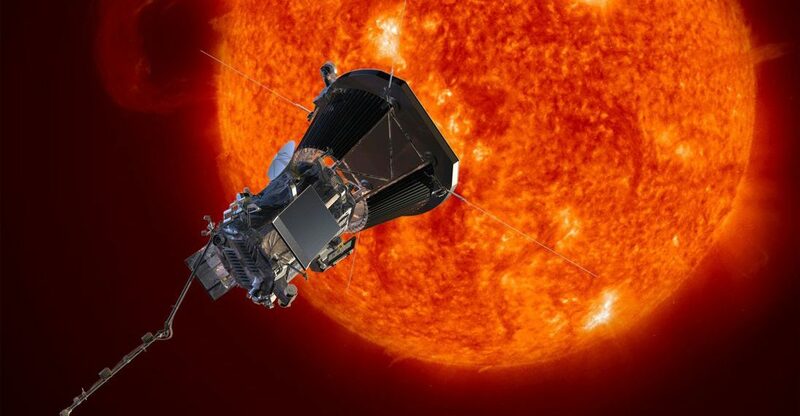 “When it nears the Sun, the probe will travel rapidly enough to go from New York to Tokyo in one minute – some 430,000 miles (700,000 kilometers) per hour, making it the fastest human-made object.